From its bold looks to the class-above experience it offers the driver and passengers, Mazda’s CX-9 has earned a reputation for excellence, being named a finalist for both North American Utility Vehicle of the Year and World Car of the Year. Mazda engineers haven’t rested on their laurels, however, adding numerous upgrades to the 2018 CX-9 flagship crossover SUV, further strengthening the “Mazda Premium” indulgences it provides. Among the highlights are more features at every price point such as an improved second row for both greater comfort and easier third-row access and greater sound insulation in what is already one of the quietest vehicles in its class. All 2018 CX-9 models receive Smart City Brake Support (SCBS) for the first time, a technology that can automatically apply the brakes in emergency situations below 19 mph. CX-9 joins the 2018 Mazda3 compact sedan and 5-door, 2018 CX-3 subcompact crossover SUV and 2017 CX-5 compact crossover SUV in having SCBS as standard. SCBS is a technology that comes as part of Mazda’s i-ACTIVSENSE suite of safety systems. Additionally, Blind Spot Monitoring and Rear Cross-Traffic Alert are now standard. CX-9 is one of a handful of three-row crossover SUVs to earn a 2017 Insurance Institute for Highway Safety “Top Safety Pick+” recommendation, joining all Mazda models tested to earn the nonprofit’s highest award when equipped with proper headlights and specific technologies. 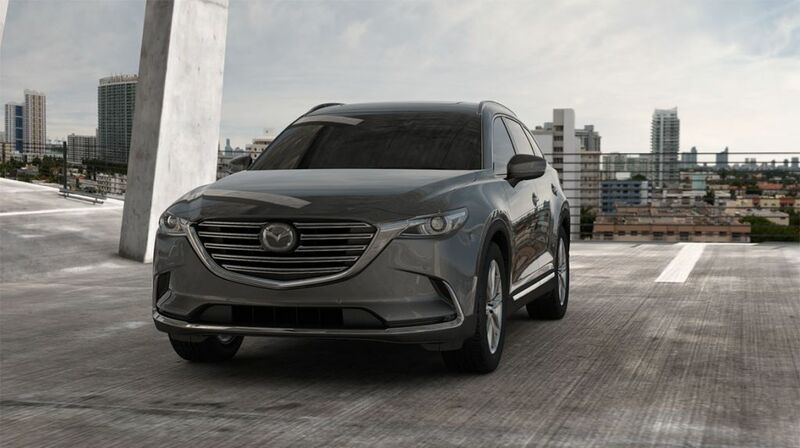 CX-9’s engaging driving dynamics are a further hallmark of the Mazda brand, complemented by its industry-exclusive G-Vectoring Control (GVC), which is new to CX-9 models for 2018. GVC uses the engine in conjunction with steering and throttle inputs to minutely reduce engine torque, putting more weight on the front wheels and making the steering feel more linear and direct. As a result, the driver is able to gain more confidence and control behind the wheel. For 2018, Mazda’s midsize family crossover SUV returns with Sport, Touring, Grand Touring and Signature trim levels, but it includes more equipment at each price point. Besides the newly standard safety technology and refinements, CX-9 Sport features cloth upholstery, standard LED headlights and tail lights, 18-inch alloy wheels, an electronic parking brake, MAZDA CONNECTTM infotainment with a 7-inch screen and Bluetooth audio streaming and phone pairing as standard. In its newly available Sport Package, the standard CX-9 adds auto on/off headlights, High Beam Control, Lane Departure Warning, Lane-Keep Assist, Smart Brake Support, rain-sensing wipers, heated front seats and a power driver’s seat. Additionally, the Sport Package includes full-speed Mazda Radar Cruise Control. The mid-level CX-9 Touring adds leather seating surfaces, an auto-dimming rearview mirror with built-in Homelink garage door opener, power liftgate, Advanced Keyless Entry and an 8-inch MAZDA CONNECTTM screen. New Mazda CX-9 Touring features include the addition of a tilt function on the driver’s seat and power passenger seat with lift and lumbar support. CX-9 Touring’s Premium Package includes LED fog lights, navigation, a lauded BOSE® 12-speaker Premium audio system, SiriusXM satellite radio with a 4-month subscription, rear parking sensors, new front parking sensors, sunroof, retractable sunshades in the second-row doors and a moonroof. The high-trim CX-9 Grand Touring includes 20-inch wheels, Adaptive Front-lighting System, aluminum interior trim, Active Driving Display head-up unit with new Traffic Sign Recognition, roof rails and a memory driver’s seat. CX-9 Grand Touring’s all-new features include heated second-row seats, a heated steering wheel and windshield wiper de-icer. Finally, the top-of-the-line CX-9 Signature adorns the interior with Auburn-colored Nappa leather, rosewood trim supplied by premium Japanese guitar-maker Fujigen and LED signature grille and LED interior lighting. It is with its upmarket KODO design, refinement, driving dynamics and technology that CX-9 has found a home with premium crossover SUV intenders, with more than 55 percent of those purchasing a CX-9 this year opting for a CX-9 Grand Touring or Signature model. Yet, all CX-9s come standard with Mazda’s torque-rich, turbocharged and efficient SKYACTIV-G 2.5T engine, paired to a 6-speed SKYACTIV-DRIVE automatic transmission. Front-wheel is standard for CX-9 Sport, Touring and Grand Touring models. Mazda’s predictive i-ACTIV all-wheel drive is available on all three trim levels and standard for CX-9 Signature. The 2018 Mazda CX-9 will arrive at dealerships nationwide this month. MSRP does not include $940 for destination and handling ($985 in Alaska), taxes, title or additional fees. Dealers set actual sale prices. 2017 CX-9 versus 2017/2018 three-row, midsize crossover SUVs. Based on both internal data and data provided in Car and Driver crossover SUV comparison test, August 2017.